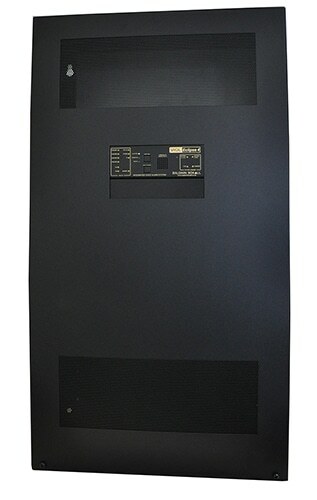 The VIGIL Eclipse4 is a stand-alone, EN54 certified, voice alarm/public address system. It is a complete, fully monitored system which takes up less floor space and is ideal for fitting into building risers or places where space is restricted. VIGIL Eclipse4 is the next generation product in this range. It uses the new VIGIL3 transformerless amplifiers and the new VIGIL3 battery charger with VIGIL2 EVAS routeing technology. What are the benefits of the Eclipse System? Quite simply, the Eclipse is a fully integrated voice alarm system which takes up minimal floor space and is secured by bolting to a wall or other suitable solid upright structure. It is ideal for fitting within building risers and is easily networked to form a comprehensive voice alarm or public address system. The modular nature of the system provides adaptability and is suitable for many types of building. In addition to its usefulness for high-rise style structures, the Eclipse also fits well as a ‘tenant’ system for ‘landlord/tenant’ voice alarm system solutions.